Shown with Cocktail Table & End Table. 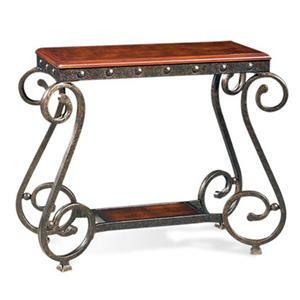 Give your living room a beautiful accent with this sofa table that is pleasing to the eye. 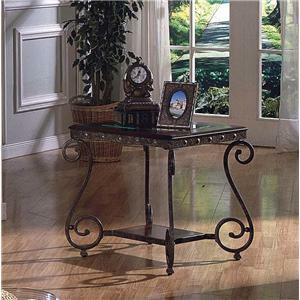 Made of wrought iron, wood and glass tops, this accent table will leave nothing to be desired. With the delicate music note design legs to dazzle her and the masculine touch of metal studs for him these tables are an easy choice for both. Place behind a sofa or against a wall and accent with candles, flower arrangements, lamps and more that will enhance the look and feel of your living spaces. 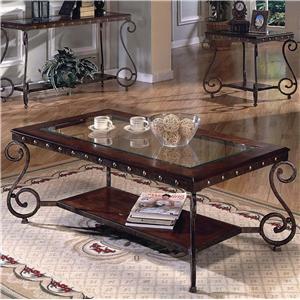 The Ellery Rectangular Sofa Table at Morris Home in the Dayton, Cincinnati, Columbus, Ohio, Northern Kentucky area. Product availability may vary. Contact us for the most current availability on this product. Wood & Finish Antique brass finish. Case Detail Tubular steel tables legs. Protective floor glides. Studded accents. Description: Top 8 mm glass table tops with beveled edges. Case Construction Durably crafted tubular steel and hand selected hardwood. Enhance the beauty of your home with the Ellery Collection. A fusion of metal and glass combine together to create this aesthetically pleasing dining and living room furniture. This collection features durable crafted tubular steel and hand-select hardwood and 8 mm beveled glass. 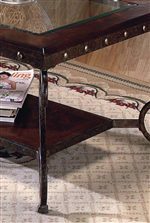 Curvy cabriole legs and steel base construction and brass studded base give this collection a design that easily fits either contemporary or traditionally styled homes. The smooth and modern look of this collection will give a clean-cut and sophisticated look in your home while effortlessly providing an enhancement. 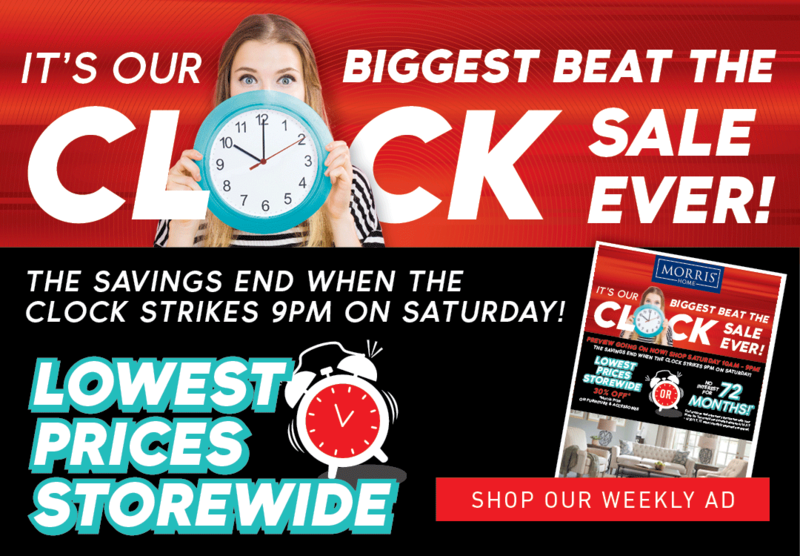 The Ellery collection is a great option if you are looking for Transitional furniture in the Dayton, Cincinnati, Columbus, Ohio, Northern Kentucky area. 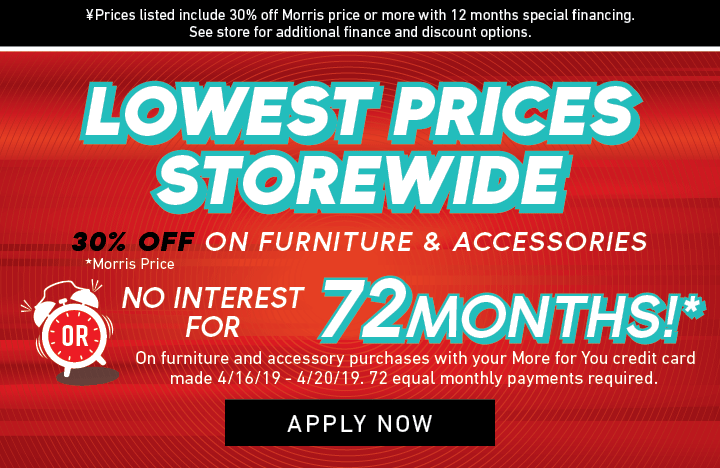 Browse other items in the Ellery collection from Morris Home in the Dayton, Cincinnati, Columbus, Ohio, Northern Kentucky area.